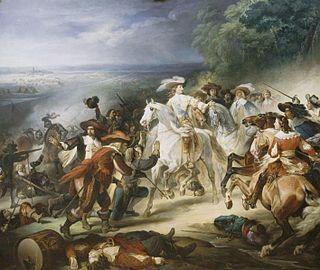 The Battle of Fleurus of August 29,1622 was fought between a Spanish army, and the Protestant forces of Ernst von Mansfeld and Christian of Brunswick during the Thirty Years War. The bloody struggle left the Protestants mangled and the Spanish masters of the field, after failing to relieve Heidelberg, besieged by Tillys army, Frederick V, Elector Palatine, decided to disband his army. On July 13,1622 the contract was cancelled and the army of Mansfeld. The Protestant army departed from Alsace and at a fast pace crossed Northern France and he was in danger of being trapped between the two enemy armies, his line of retreat towards Antwerpen blocked by the invading German army. Gonzalo Fernández de Córdoba, commander of the Spanish army in the Palatinate, was recalled in a hurry to stop that army. 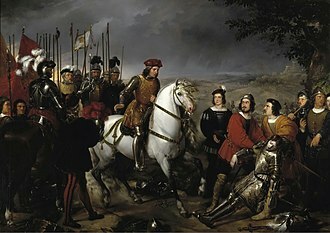 Cordoba marched through the Duchy of Luxembourg and the terrain of the Ardennes. The Protestant army advance guard met Spanish cavalry scouts on August 27, Córdoba, much weaker in cavalry, had assumed a blocking position north of the town of Mellet, near Fleurus, with flanks supported by woods. The Protestant commanders deployed their army to try to break through the Spanish position, there were 29 cuirassier companies and 24 arquebusier companies. All except 4 veteran cuirassier companies had been raised in 1621 and 1622 and they were composed by Walloon recruits and they had performed poorly at the Battle of Wimpfen, so Cordoba was obviously concerned about the flanks of his army. The infantry was of much material, poorly equipped, it had suffered the most in the march. After a short cannonade, Mansfeld ordered a general advance, some gaps opened up in the poorly drilled German infantry, and De Sylva attacked an exposed flank, routing one Battalion. However, Streiff counterattacked, the Walloon cavalry was wrong footed and suffered damage from enemy pistol fire. De Sylvas cavalry took refuge behind the wagons, while Streiff turned on the Spanish infantry. In a desperate charge, Brunswick was wounded, and his cavalry, demoralised. After five hours of fighting, Mansfeld ordered a retreat, it was midday. The invading armies captured a few smaller places before investing Leuven. 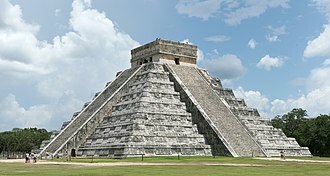 The siege was a failure due to bad logistics and organization. The Duchy of Cleves was occupied during August and September with the aim of linking the fort with the body of the Spanish Netherlands. While Frederick Henry, Prince of Orange, started the siege of Schenkenschans, the fortress fell after a long and costly siege that lasted even through the winter months. Meanwhile, Cardinal Richelieu took the decision of remove Châtillon from command, in late May, the offensive operations were suspended and a secondary thrust was launched into France, according to the Cardinal-Infante, because of a dramatic change of the circumstances. Philip IV write to his brother on June ordering him to advance into northern Brabant to try to recapture Schenk, on 4 July the Cardinal-Infante, commanding a lightly equipped army, crossed the frontier via Avesnes and took the fortresses of Le Catelet and La Capelle. 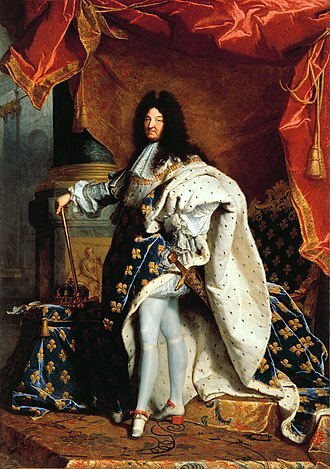 Alarmed by this advance, the King of France Louis XIII was forced to move to Paris from Fontainebleau. The French armies regained most of the lost ground over the months, including Corbie. Olivares, though distressed for the loss of Corbie, planned an offensive against France for the following year. In July Frederick Henry of Orange, seizing the moment, invested Breda in command of 22,000 soldiers. Garrisoned by 3,000 Spaniards, Italians and Burgundians, Breda was one of the fortresses of the Spanish Netherlands. A Spanish force under the Cardinal-Infante Ferdinand attempted to relieve the garrison of the city, Ferdinand decided move with his army to the valley of the Meuse, where he took Venlo and Roermond in order to distract Frederick Henry. He was, forced to turn back shortly after due to the French advances in Artois and Luxembourg, and Breda was captured by the Dutch on 7 October. His main objective would be the capture of Rheinberg, which would give to Spain a crossing point in the Lower Rhine, by 26 May his army had invested the town. Three days the outpost of Arques was captured and its defenders,50 soldiers of the Walloon Tercio of Baron of Wezemaal and his officer, surrendered after a brief bombardment by the French artillery. 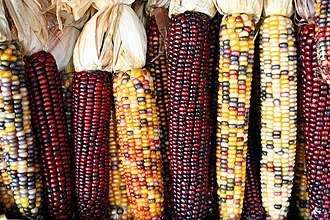 The Peasants War in Upper Austria was a rebellion led by farmers in 1626 whose goal was to free Upper Austria from Bavarian rule. The motive was an escalation of the Bavarian kingdoms attempt to press the country into the Catholic faith at the time of the Thirty Years War, in the beginning of the Thirty Years War, Upper Austria was pledged to the Bavarian Kingdom by the House of Habsburg. The new ruler assumed cuius regio, eius religio and tried to convert the lands to the Catholic faith, in May 1625, the Protestant priest of the Frankenburg am Hausruck parish was replaced by a Catholic priest sent from Bavaria. 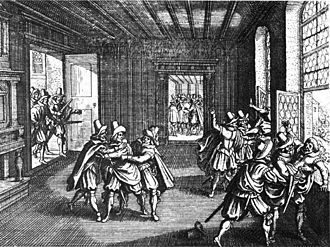 After an armed uprising, the new priest was forced to flee from the castle, the men feared the reaction from Bavaria and surrendered three days later. Adam von Herberstorff, the Bavarian steward of Upper Austria, called all of the men from the region to the Haushamerfeld near Frankenburg to hold the assizes, the 36 men who had led the revolt were among the 5,000 gathered. The court sentenced the men to death, but allowed half of them to go free, two men would step forward, and one would hang while the other would go. A roll of the dice determined their fate, the steward had thought that the harsh sentence would frighten the peasants, but it only served to increase dissent and give sympathy to the rebels. Over the next year, the peasants secretly prepared for war by recruiting a man from every house, supplying them with weapons. They intended to attack on the Pentecost, but war had broken out two weeks earlier, when two Bavarian soldiers tried to steal a cow in Lembach, in response, a number of peasants on a pilgrimage near Lembach quickly assembled to slaughter the Bavarian garrison of 25 men. The group continued to collect more recruits on their way to Peuerbach, even before the full size of the peasant army was assembled in Peuerbach, a number of companies attacked them and were quickly defeated. The new commissioners of the region were elected summarily on the battlefield, the 5, 000-strong peasant army went on to besiege Eferding, Kremsmünster, and Steyr, finally arriving at Linz, which did not surrender despite being defended by only 150 Bavarian soldiers. During the siege of Linz, the leader, Stefan Fadinger, was shot. He died on July 5, two weeks after the fatal gunshot and it took months for Bavaria to send troops under Pappenheims command to relieve the town at the end of August. The siege lasted from November 1630 until 20 May 1631. The Thirty Years War had been raging for a dozen years by the time that the city of Magdeburg rose up against the Holy Roman emperor. 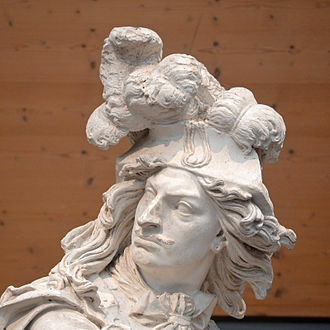 His army consisted primarily of his Swedish countrymen, but the armies of the Holy Roman emperor were a mix of Hungarians, Spaniards, Italians, Frenchmen and others. In a matter of months, imperial forces under the command of the Count of Tilly laid siege to the city. On the last day of the siege Magdeburgs councilors were convinced that it was time to sue for peace, the siege was ended and Imperial Field Marshal Gottfried Heinrich Graf zu Pappenheim, and Johann Tserclaes, Count of Tilly, attacked Magdeburg for its rich stores of goods. The citys fortifications were breached and imperial forces were able to overpower armed opposition, the city was dealt another blow when Colonel Dietrich von Falkenberg, a nobleman sent by King Gustavus to direct Magdeburgs military affairs, was shot dead by Catholic imperials. When the city was almost lost, the garrison mined various places, after the city fell, the Imperial soldiers went out of control and started to massacre the inhabitants and set fire to the city. The invading soldiers had not received payment for their service and took the chance to loot everything in sight, otto von Guericke, an inhabitant of Magdeburg, claimed that when civilians ran out of things to give the soldiers, the misery really began. For the soldiers began to beat and threaten to shoot, hang and it took only one day for all of this destruction and death to transpire. Of the 30,000 citizens, only 5,000 survived, for fourteen days, charred bodies were carried to the Elbe River to be dumped to prevent disease. In a letter, Pappenheim wrote of the Sack, I believe that over twenty thousand souls were lost and it is certain that no more terrible work and divine punishment has been seen since the Destruction of Jerusalem. All of our soldiers became rich, after Magdeburgs capitulation to the imperial forces, there was much bickering between the residents who had favored resistance against the emperor and those who had been against such an action. 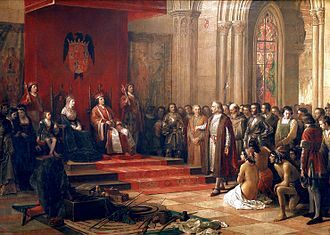 The Treaty of Stettin or Alliance of Stettin was the legal framework for the occupation of the Duchy of Pomerania by the Swedish Empire during the Thirty Years War. Concluded on 25 August or 4 September 1630, it was predated to 10 July or 20 July 1630, Sweden assumed military control, and used the Pomeranian bridgehead for campaigns into Central and Southern Germany. Some of the Pomeranian nobility had changed sides and supported Brandenburg, following the Capitulation of Franzburg in 1627, the Duchy of Pomerania was occupied by forces of Ferdinand II, Holy Roman Emperor, under command of Albrecht von Wallenstein. Sweden and Stralsund concluded an alliance scheduled for twenty years, the Danish campaigns in Pomerania and other parts of the Holy Roman Empire ended with the Battle of Wolgast in 1628 and the subsequent Treaty of Lübeck in 1629. Except for Stralsund, all of Northern Germany was occupied by forces of the emperor, in 1629, the emperor initiated the Re-Catholization of these Protestant territories by issuing the Edict of Restitution. The Truce of Altmark ended the Polish–Swedish War in September 1629, plans of Gustavus Adolphus of Sweden for such an intervention were approved of by a Riksdag commission already in the winter of 1627/28, approval by the Riksråd followed in January 1629. On 26 June or 6 July 1630, Gustavus Adolphus of Sweden with a fleet of 27 ships arrived at the island of Usedom, the core of the invasion force consisted of trained peasants, recruited to the Swedish army following Gustavus Adolphus military reforms of 1623. The western flank of the Swedish invasion force was cleared from Stralsund, which served as the basis for Swedish forces clearing Rügen, the Swedish landing force faced Albrecht von Wallensteins imperial occupation forces in Pomerania, commanded by Torquato Conti. Large parts of the army were pinned down in Italy. Wallenstein, who two years before had expelled the Danish landing forces at the place was about to be dismissed. 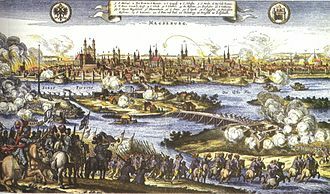 On 9 July, Swedish forces took Stettin, but throughout 1630 were content with establishing themselves in the Oder estuary, the first draft of a Swedish-Pomeranian alliance, which the Pomeranian ducal councillors had worked out since 20 July 1630, was rejected by Gustavus Adolphus of Sweden. 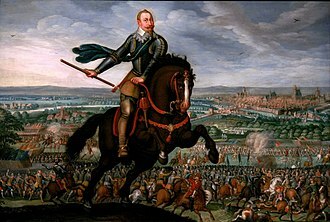 A second draft was returned to the council together with a list of modifications Sweden insisted on, on 22 August, actual Swedish-Pomeranian negotiations started, which Gustavus Adolphus on 1 September joined in person. The final negotiations lasted from 2–4 September, the actual agreement was made on 25 August or 4 September, but pre-dated to 10 July or 20 July 1630. The alliance was to be eternal, the treaty included the alliance with Stralsund of 1628, which was concluded when the town resisted the Capitulation of Franzburg and was thus besieged by Albrecht von Wallensteins army. Subsequent treaties were the Pomeranian Defense Constitution of 30 August 1630, the Swedish king and the high-ranking officers were given absolute control over the duchys military affairs, while the political and ecclesial power remained with the dukes and towns. The duchys foreign affairs were to be within the responsibility of the Swedish crown, the amending treaties were necessary because the Pomeranian nobility had insisted on having the shift in military control of the duchy to Sweden separate from the Swedish-Pomeranian alliance. 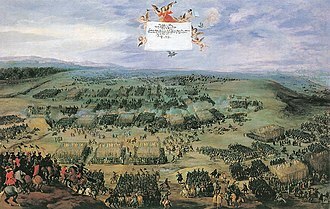 The Battle of Oldendorf on 8 July 1633 was fought as part of the Thirty Years War between the Swedish Empire and the Holy Roman Empire near Hessisch-Oldendorf, Lower Saxony, Germany. The result was a victory for the Swedish Army. The Landgrave of Hesse-Kassel, William V, as a Protestant ally of Sweden had campaigned in Westphalia, Ruhr area, the imperial defense of the Weser area in 1633 was led by Jobst Maximilian von Gronsfeld. The battle was preceded by a Swedish siege of the nearby town of Hameln. Merode commanded 4,450 infantrymen and 1,245 cavalry troops, Bonninghausen 4,475 infantry and 2,060 cavalry, the armies met near Hessisch-Oldendorf, northwest of Hameln. Both armies attacked, an event in the Thirty Years War. The left wing of the Swedish forces was commanded by the general of Landgraviate of Hesse-Kassel, field marshal Torsten Stålhandske led a Swedish brigade. Field marshal Gottfried von Geelen participated in the battle on the imperial side, Gronsfeld was captured after his wing was routed by Melander, leaving over 3,000 dead and wounded and 1,000 prisoner. Christian the Younger of Brunswick, Duke of Brunswick-Lüneburg and Bishop of Halberstadt. Cuirassier, this heavy cavalry formed the backbone of the Protestant Army. Cavalry arquebussiers, unlike dragoons, fired from horseback, and were a light cavalry much favoured by the Army of Flanders. Alte Nahebrücke, Bad Kreuznach . View of Heidelberg with the Heidelberg Castle on hill and the Old Bridge. Frederick V of the Palatinate by Michiel van Mierevelt. Heidelberg Castle and the Hortus Palatinus commissioned by Frederick V, and designed by the English gardener Inigo Jones and the French engineer Salomon de Caus. Relief of Genoa by the Marquis of Santa Cruz by Antonio de Pereda. Museo del Prado. 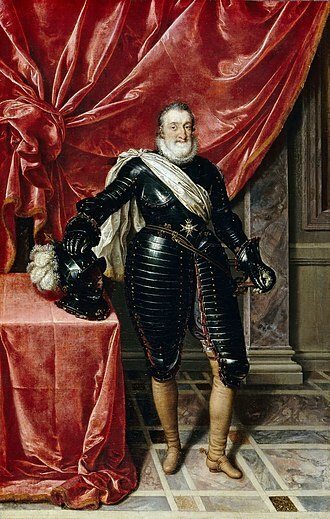 François de Bonne, Duke de Lesdiguieres, commander of the French army. Battlefield in Mingolsheim / Bad Schönborn. The Capture of Oppenheim by Wenzel Hollar. Portrait of Charles IV, Duke of Lorraine, by an unknown author. Christian IV of Denmark-Norway with his navy. The painting by Vilhelm Marstrand depicts him at the Battle of Colberger Heide, 1644.